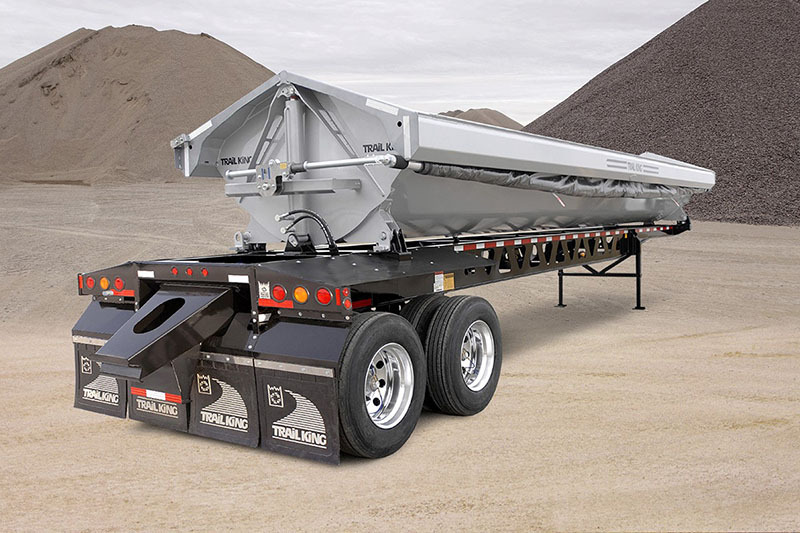 Side Dump Trailer - Kingpin Trailers LTD. 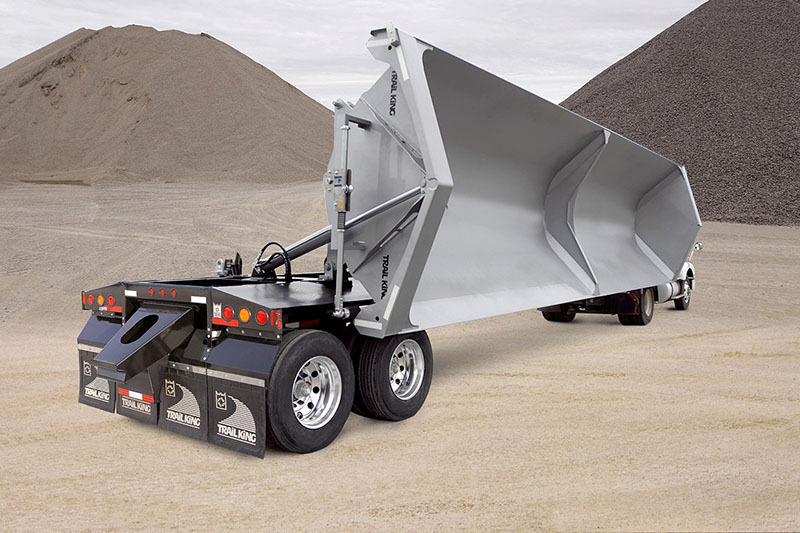 The two-piece rolled design of Trail King’s Steel Side Dump (SSD) tub delivers fast, clean dumping of your payload away from the trailer, with no “carry back.” What’s more, the formed top rail and exterior tub reinforcement helps the tub resist twisting and flexing. 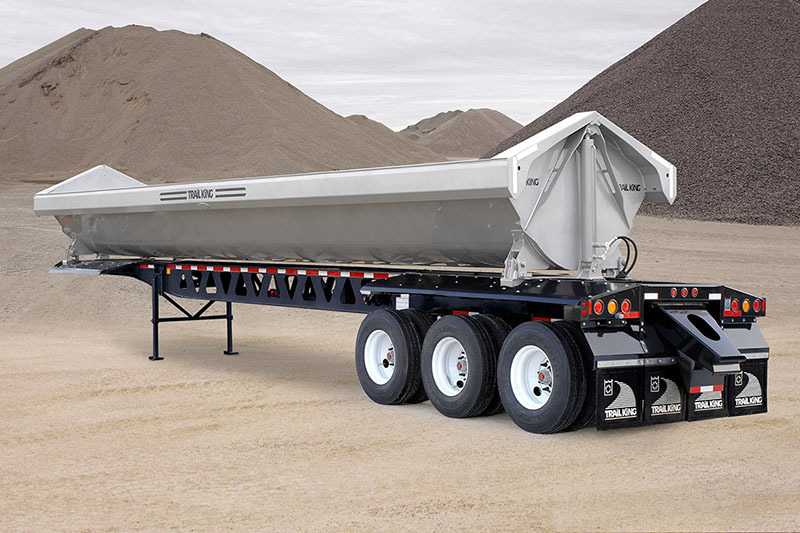 Main frame I-beams constructed of one-piece web and flange material, combined with full-depth angle-mounted cross members, result in a trailer with the rugged strength and durability to stand up to your toughest loading, hauling, and dumping demands for years to come. The Trail King SSD… destined to be the best side dump you’ll ever own. The lock-down retainers feature an extended alignment guide so the pivot bushing returns to sit perfectly in the pivot saddle every time. The larger bearing surfaces reduce wear and provide full contact with the pivot bar for a stronger, more secure lock down. All pivot points are mounted on full-width I-beam cross members for the most load-bearing strength possible. (Standard) Also available with pintle hitch. Twin, 5″ bore, single-stage cylinders offer maximum stability when dumping. The single-stage cylinders are very low-maintenance. Their two-pin mounting makes them easily removable if they need to be repaired or replaced. Trail King I-beams are constructed of one-piece web and flange material. The result is a mainframe that is stronger, with less twisting and load “bounce”… all of which reduces opportunity for the frame to develop cracks. Design payload 40,000 lbs. 40,000 lbs. 60,000 lbs. 60,000 lbs. 60,000 lbs. 60,000 lbs. Capacity (water level) 11.5 cu. yds. 17.0 cu. yds. 21 cu. yds. 21 cu. yds. 23 cu. yds. 23 cu. yds. Capacity (full) 15.5 cu. yds. 24 cu. yds. 29 cu. yds. 29 cu. yds. 31 cu. yds. 31 cu. yds. Empty weight +/- 3% 10,260 lbs. 12,745 lbs. 14,010 lbs. 14,310 lbs. 16,350 lbs. 19,240 lbs.